One of my favourite parts in Yoga is the Sun Salutation; even if, or especially because, it is repeated in most classes. Its repetition gives a special flow and you can just let yourself sink into its sequence, relax, breathe and enjoy. It is a the sequence that covers most body parts. And depending on your mood, time and reason for getting into the Sun Salutation it can be fast, more like a workout, or slow to really hold and pay attention to the posture, your breathing and to increase the strength in all areas, or even just to have a run through the flow to move to relax your body and mind. It might always be the same moves, yet a vast area of possibilities to enjoy! If there is no time for more, the Sun Salutation is definitely the one thing to do. May it be one round (one round = two times to do both sides equally) or more – get into the flow and let go! 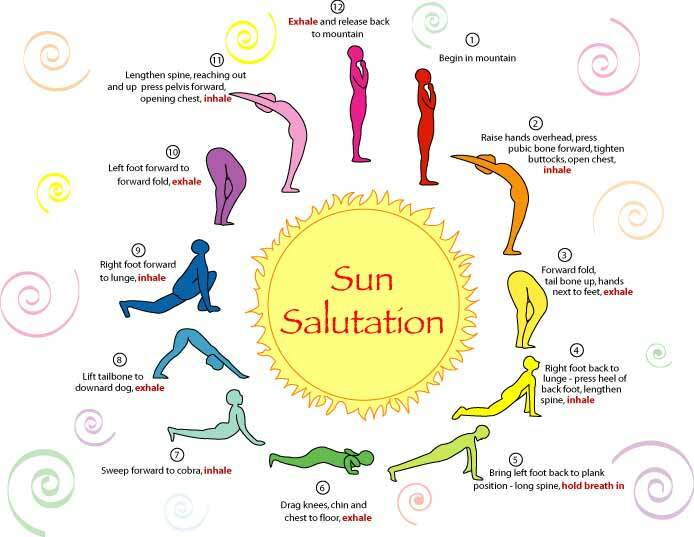 There are different variations of the sun salutation, below is the one I got hooked up to.